Brief Description: Red Sea's REEFER Deluxe Concept series, provide advanced hobbyists with a solid foundation for building a reef or marine aquarium. 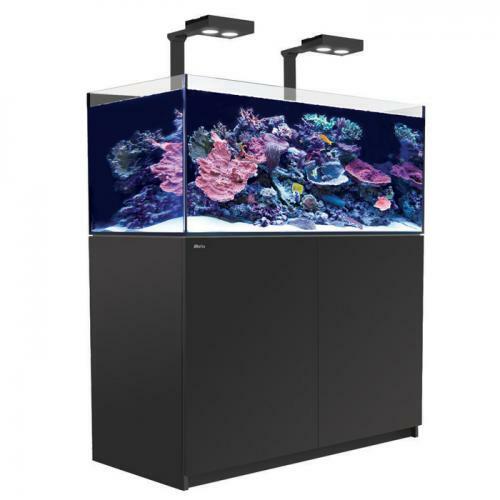 The REEFER Deluxe Concept 250 combines a rimless, ultra-clear glass aquarium, with an elegant cabinet and a comprehensive water management system. This model is also equipped with two all-new Hydra 26 HD LED Lighting Units. These Lighting Units saves power and offers a full 7 color LED spectrum configuration, demonstrating the most up-to-date technology. The beautiful modern design of the REEFER Deluxe will enhance the look of any living space. Note: The shipping costs on these items, which need to be transported by truck, may or may not be accurate depending on your location. Please call or email for a fixed quote. Notify me when "Red Sea REEFER 250 DELUXE System with 2 X Hydra HD 26 LEDs - [54 gal - Black]" is re-stocked.